Pairs such as 123 and 456 are obviously allowed since they don't share any digits in common. 123 and 321 are allowed together since, while they have the same exact digits, only the 2 is actually in the same position. 812 and 212 would not be allowed since they both share the "12" at their end, which is two digits. 206 and 246 are similarly not allowed; the shared digits don't need to be contiguous. Remember this needs to hold for every pair of numbers in the subset. What is the largest (as in most elements) possible set which satisfies this condition? How about the set with the largest sum of elements? 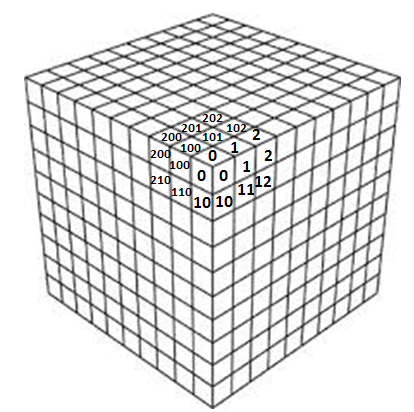 Note that every number in any 'strip' of ten cubes (row or column) shares 2 digits in common. Therefore you need to pick numbers such that no number shares a 'strip'. After thinking for a bit it is clear you will only be able to pick 100 such numbers. To add to PrisonMonkeys' answer, every set with 100 elements will have the same sum, which is 49950. For each place in the number, each digit can only appear in that place at most 10 times, because it cannot appear with the same value for another place twice. This means that each digit must appear in each place exactly 10 times, for there to be a total of 100 numbers in the set. Therefore we can sum each place separately to get 45000+4500+450=49950. For element $0 \leq n \leq 99$, add ABC to the set where AB is $n$ (with a leading zero if $n < 10$) and C is A+B mod 10. So for $n=3$, AB is 03 and C is 0+3 mod 10=3, meaning ABC is 033. There are no pairs of numbers in this set that violate the condition (as far as I know, that is). And there is no three-digit number ABC with a different AB part, since I covered all 100 possibilities. Which means that this is the largest possible set which satisfies the condition. I have no solution for the second question yet.